Alia Bhatt has always made sure to take a break from work. The Badrinath Ki Dulhania actress was off to London for a short break with sister Shaheen Bhatt. Alia was snapped returning from London at the Mumbai airport on November 26, 2017. The Udta Punjab actress looked gorgeous in a black tank top, black pants and a black leather jacket with long black boots. Alia tied her hair in a high bun and preferred the no-make-up look. The actress also graced the ongoing International Film Festival of India in Goa on November 28, 2017 along with colleagues, Katrina Kaif, Sidharth Malhotra and Salman Khan. On the work front, the actress recently wrapped filming for the upcoming film, Raazi and has already begun filming for another project Gully Boy opposite Ranveer Singh. Alia has also signed another project Brahmastra opposite Ranbir Kapoor which will be produced by Dharma Productions. 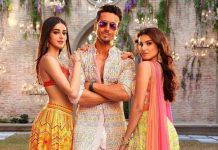 The actress was last seen in the film Badrinath Ki Dulhania opposite Varun Dhawan. Exclusive photos of Alia Bhatt at the airport!